Although clearly modern and cosmopolitan, Abu Dhabi – one of seven Emirates that make up the United Arab Emirates – has a fascinating past that stretches back some 8,000 years. 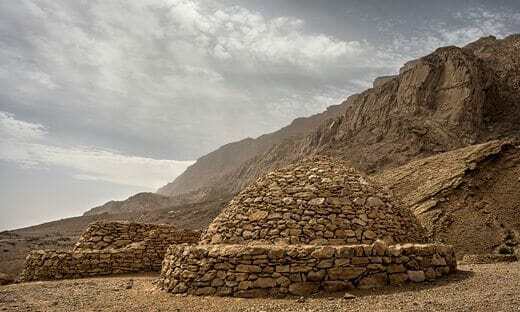 At a series of recently developed archaeological and historical sites, some of which are listed UNESCO World Heritage Sites, visitors get to see the evidence for one of humanity’s greatest transitions – that from hunting and gathering to a farming way of life. Much later, an eighteenth century fort, a striking contrast to the surrounding glass-clad high-rise buildings, tells the story of Abu Dhabi’s more recent past. While the groundbreaking Louvre Abu Dhabi makes connections between this region and other great civilisations and cultures of the world. Established in the early 1890s at the Al-Jahili Oasis, Al Jahili Fort is one of the largest historical forts in the United Arab Emirates. The fort was built for Zayed the Great, grandfather of the founder of the UAE, as a residence for the ruling Al Nahyan family. 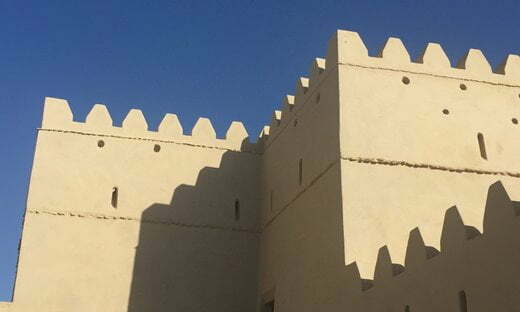 After extensive restorations the fort was opened to the public in 2008, and is today a popular tourist attraction in Al Ain. The Emirates Heritage village is a living museum with re-constructions of an oasis desert camp and a fishing village to show what life was like in different parts of premodern Abu Dhabi. How people made a living in harsh desert conditions is contrasted with village life that centred around the souk and mosque. Visitors also get to see craftsmen and women using traditional methods of spinning, weaving, metal working and pottery. 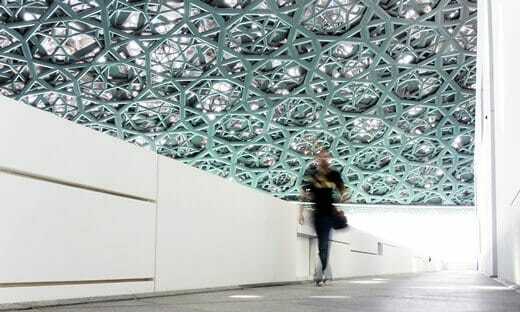 Opened in November 2017, the museum is the first of its kind in the Arab world. Twelve galleries showcase objects from some of the best French museums, including the Musée d’Orsay and the Louvre. Prehistoric artefacts to contemporary artworks are juxtaposed to focus on common themes throughout humanity. From religion and trade, to the royal art of courts, challenging modernity and the global stage. Built sometime in the 1790s, the conical tower is the oldest stone building in the city of Abu Dhabi. It was constructed to protect the emerging settlement here, which lay on the coastal trade routes. Over the years since its construction it was a palace for the ruling family and the seat of government. Now with oral testimonies and historical photographs it houses a permanent exhibition on Emirati culture and tradition. 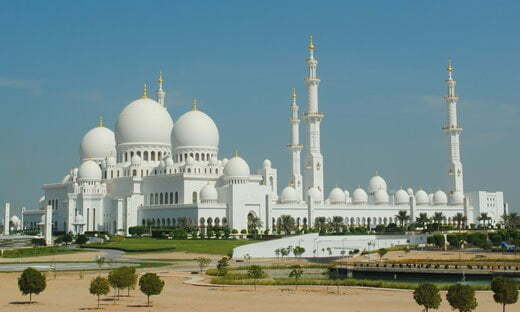 One of the few mosques to allow tourists, and covering over 12 hectares it is one of the largest mosques in the world. Architectural features were borrowed from many Islamic countries, including Egypt, Pakistan, Turkey and Morocco. It has many striking features, from the world’s largest carpet – handmade in Iran – lies in the main prayer room, to the third largest crystal chandelier in the world.